I have the great privilege of being in partnership with a well-established probate and estate planning attorney, Anna Serrambana. Our conversations have sparked some very exciting conversations of what our clients and community need in order to protect their families and thrive. In my bankruptcy practice, I deal with people that are under an enormous amount of stress as the try so hard to avoid bankruptcy, yet the inevitably find themselves unable to do it on their own without our help. Whether you’re struggling to this level, or you’re just feeling the budget tighten, you still need to have certain legal documents in place to protect your family after you’re gone. It’s important to keep your financial papers in a fireproof lock box and in sealed plastic to keep them from being destroyed in a fire or flood. 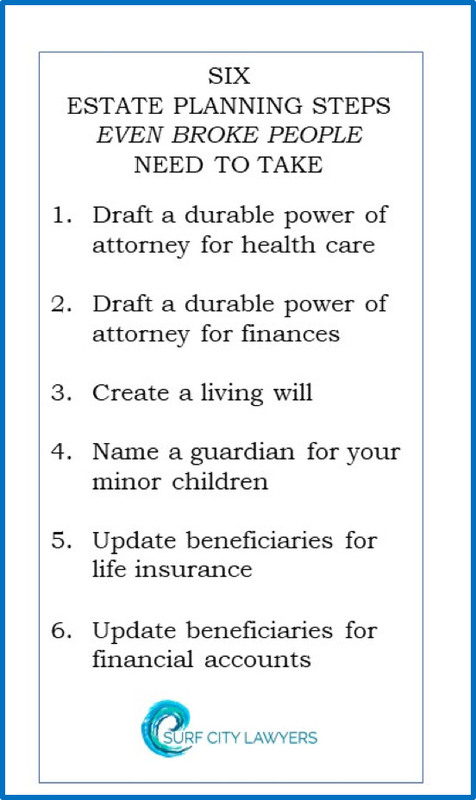 Remember that estate planning is a process, not a conclusion. We believe that a well-crafted estate plan is like giving your family a love letter after you’re gone. Isn’t that what you would want? Then give first and get it done.